A full range of nylon and polypropylene pipe, hose and nozzle fittings are now available from Real-Time Industrial Supply Co., of Cleveland. Available sizes range from 1/8” to 2” in both plastic materials. Configurations include thread-to-thread, barb-to-thread and barb-to-barb. 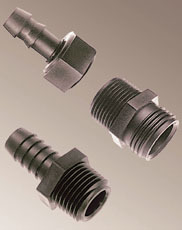 Nylon fittings are generally acceptable for working pressures up to 150 psi at normal room temperatures. At very low pressures, temperatures can approach 175 degrees F without strength degradation.